$40 local deliveries by professional drivers is just another way we show commitment to our customers. 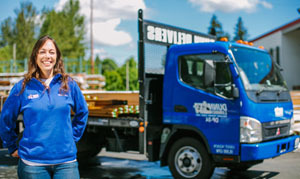 Call your favorite Dunn Lumber salesperson ​to schedule a delivery to your jobsite! Dunn also coordinates with local freight forwarding companies and heavy equipment service providers to meet your specific jobsite needs. For more information contact the Dunn Lumber Yard nearest you.